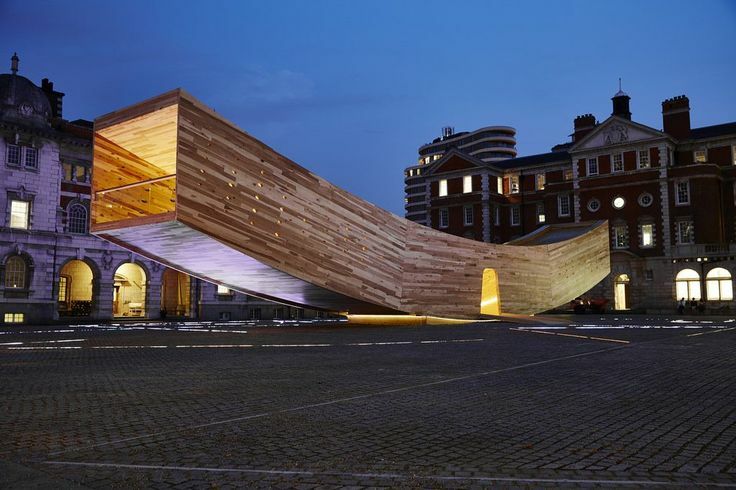 “The Smile” is an experimental building – part pavilion, part sculpture – designed to showcase the structural and spatial potential of a material that could transform the way architects and engineers approach timber construction. With the rapid rate of global urbanisation and industrialisation in the past few centuries, majority of people are now living in cities build up from steel and concrete. These materials are mostly used in the basic structure of buildings and are strong enough to retain structural integrity. In this sense, the use of timber for the same function has been a rare occurrence due to physical limitations. The timber panels manufactured for construction were previously too small to serve as a foundation material. However, with the new Cross Laminated Timber (CLT) technology, large engineered wood panels are able to be made from small trees. This is a big step into the development of future timber based constructions. The CLT timber is engineered in a way that separate panels are glued to each other at 90 degree angles. This means that the wood grains are fitted onto each other in a criss-cross fashion, which further strengthens the integrity of the final product. The manufactured CLT boards are comparable to pre-cast concrete in terms of size. Due to the physical properties of these timber panels, they are able to be easily transported as a half finished product and assembled on site. This is one of the biggest advantages of this material that makes it favourable in the eyes of builders. Materials such as steel and concrete have to be transported as a final product which is a lot more costly and inefficient. As a design element, timber portrays a more comforting ambiance. It is a more natural resource that gives a stark contrast to the blandness of concrete and steel. A wood based building has softer lines and can infuse a sense of relaxation compared to the hard edges of the concrete jungle that we have grown accustomed to. The architectural trend of our age is backing away from hard concrete and have adopted a more natural approach. The rustic appeal of wood has become a dominating element in modern designs and décor. Aside from being used for basic building structures, components of your home such as laminated flooring and wood flooring have now become a part of the key design concept. Although the idea of cutting down trees for buildings may seem damaging to our environment, timber can actually be more sustainable than previously thought. So long as the wood used to manufacture timber products are acquired from responsibly managed forests that were planted exactly for the purpose of wood harvest. We at FinFloor see a great potential for timber in the future of construction and design. It has no doubt replaced concrete and steel to become the building material of our age. That is why we offer a wide range of engineered wood floors such as Finoak that presents the epitome of timber engineering.